14-player Tipperary got the better of last year’s runners-up Westmeath by 3-9 to 1-12 in a thriller to book their final berth. Limerick defeated neighbours Clare by 1-11 to 0-10 - Kildare overcame Roscommon by 3-10 to 1-9. Tipp and their midland opponents could not be separated by the first half of action at the St Rynagh’s pitch in Banagher, which ended level . Westmeath led early on but the industrious Andrea Loughnane got Tipp off the mark with a goal. Sheila McGrath, Pamela Greville and Michelle Murtagh were causing trouble in the Tipp defence however, and Murtagh contributed four points from play in a brilliant opening-half contribution. Jenny Grace converted two long-distance frees to steady the ship however and then Niamh Treacy scored a brilliant individual goal, soloing from midfield and firing a rocket directly off the hurley to the bottom corner of the net to bring the sides level at the break. Rebecca Noonan was the heroine for Limerick, providing seven points as they overturned a four-point deficit at the three-quarter mark to win their semi by the same margin at St Brendan’s Park, Birr. 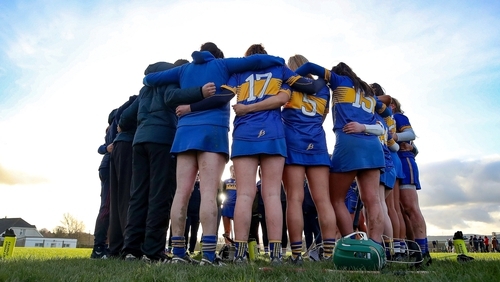 The Bannerwomen, who had beaten Limerick in the group stages by three points, were competitive throughout and with 23 minutes elapsed led by two, Regan Conway and Niamh O’Gorman sharing their six points at that juncture, and though Grace Lee pegged one back for Limerick, it was Clare that led at the interval by 0-06 to 0-05. Meanwhile, the 2018 Division 3 champions Kerry retained their place in Division 2 for next season as a result of their 0-08 to 0-03 triumph over Carlow at The Ragg. The Kingdom scored the opening five points in the first 20 minutes and with the defence holding firm and Jackie Horgan, Patrice Diggin and Laura Collins adding points, they ensured safety while Carlow make the drop.